A study permit gives you permission to study and stay in Canada on a temporary basis. You need your study permit application approved before you come to Canada, and you must apply for your initial study permit outside Canada. Start the application process as soon as you receive your offer of admission from UBC to ensure you get your permit in time. How will I receive my study permit? If your study permit application is approved, you will be issued a Letter of Introduction (sometimes referred to as a Letter of Approval or an Approval Letter). You must present this letter to the border officer when you arrive at the Canadian border. The officer will then issue your study permit at the border. I'm here for a short time. Do I need a study permit? end before your initial immigration document expires (e.g. work permit, visitor record, stamp in passport, etc). you want to extend your studies after your original program ends. Still unsure? Contact International Student Development for help. Visit our tutorial for step-by-step instructions, a list of required documents, and other important info that will help you submit a complete application. Depending on your age and other factors, there are additional or alternate steps to take when applying for your study permit. If any of the following statements apply to you, be sure to review the information carefully. I am under 19 years old. Do I need a custodian? In BC, students under 19 are considered minor children, and when they apply for a study permit, they may need to have a custodian. If you are under 17: you must have a custodian in order to study in Canada. If you are 17 or 18: an immigration officer will decide whether or not you need a custodian; if you do, an officer will notify you after you apply. For more information, check out IRCC details about minors. We recommend arranging with a close friend or relative in Canada to act as your custodian. If you don’t have a close friend or relative in Canada, you can also consider a private company to provide this service. First Choice International is a company that provides custodianship services in the Greater Vancouver Area. Note: First Choice International is not affiliated with UBC in any way. I am coming to UBC from a Canadian highschool. You must obtain a new study permit prior to starting classes at UBC because your current study permit does not allow you to study at the post-secondary level. You can do this by following the same process as extending your study permit. Apply as soon as possible and make sure you have the right study permit before you attend UBC. 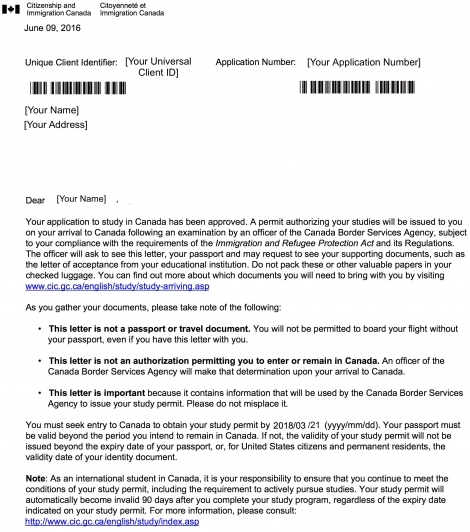 You can apply to renew your study permit online when you are in Canada. If you will not be in Canada in time to apply to extend your study permit, contact an International Student Advisor for help. I am transferring to UBC from a Canadian college or university. If you already have a valid study permit for post-secondary study in Canada, you can use that permit to study at UBC. As a post-secondary student, you can transfer between programs of study and institutions by simply changing your Designated Learning Institution (DLI) online via your MyCIC account. I am a US citizen or permanent resident, or a resident of Greenland or St. Pierre and Miquelon. As a citizen or permanent resident of the United States, or a resident of Greenland or St. Pierre and Miquelon, you can apply for a study permit directly at an international airport in Canada or at most major US/Canada border crossings. You can pay the application fee ($150 CAD) directly at the border by cash, debit, or credit card. If your spouse or common-law partner will accompany you, bring along documentation of your relationship, such as a marriage certificate or common-law partnership declaration. If you’re under 17 years old and come to Canada without a parent or legal guardian, you must secure a custodian. Refer to the above section ("I am under 19 years old") for more info. Visit the International Student Guide for helpful information about life as an international student at UBC Vancouver. International Student Advisors are available to help. International Student Advisors are Regulated Canadian Immigration Consultants (RCICs) or Regulated International Student Immigration Advisors (RISIAs) who can help. 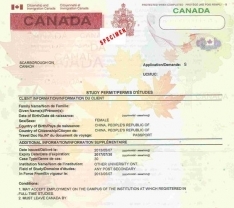 The immigration information on this page has been reviewed and endorsed by Regulated Canadian Immigration Consultants (RCICs) or Regulated International Student Immigration Advisors (RISIAs) in compliance with the Immigration and Refugee Protection Act and Regulations. However, this is not a legal document and information may change without notice. Always refer to Immigration, Refugees and Citizenship Canada (IRCC) for the most up-to-date information.